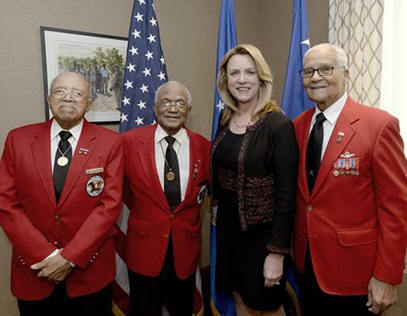 February 16, 2016 - Three members of the famed Tuskegee Airmen visited with Airmen at the Pentagon during a meet and greet hosted by Air Force Secretary Deborah Lee James. Retired Col. Charles McGee and former Cadets William Fauntroy Jr. and Walter Robinson Sr. shared stories and insights about their lives as Tuskegee Airmen and as civilians after they left the military. “I had a breadth of understanding of what could be, because I had accepted the training and the discipline,” said Robinson, who went on to be the first black postal manager in Washington, D.C. The Tuskegee Airmen were named after the Tuskegee Army Airfield near Tuskegee, Alabama, where they received their pilot and aircraft maintenance training during World War II. The Tuskegee Airmen were not just flyers but also radio operators, navigators, bombardiers, aircraft maintainers, support staff, instructors, and all the personnel who kept the planes in the air. “It was an interesting concept because the policy was … we (blacks) weren’t capable of doing anything technical, to include maintaining and flying airplanes,” McGee said. However, Congress passed a law allowing the Army to contract the primary phase of military pilot training to civilian schools; the Tuskegee Institute applied and received the contract. “We couldn’t fly yet, but our instructors were black pilots,” McGee said. While the Tuskegee Airmen were still learning how to fly, they were also dealing with segregation. “I hate(d) segregation, yet on the other hand it brought us together from 1941 to 1949, when the Air Force closed the segregated bases,” McGee said. “We became lifelong friends and we still get together annually; of course, some of us come in wheelchairs now, but that’s life.” Fauntroy, who grew up in the District, remembered the cadet corps at his high school and was surprised by the synergy he witnessed. While the red jackets the Tuskegee Airmen wear symbolize their “Red Tails” name and the achievements in the sky above Germany during World War II, they also represent other victories as well. The 996 pilots and more than 15,000 ground personnel who served with these units flew more than 15,500 combat sorties and earned more than 150 Distinguished Flying Crosses. “Have you heard of ‘Double Victory?’ We were fighting a war against Hitler in Europe and we were fighting a war against racism at home,” said McGee, who has more than 6,000 flying hours. The Tuskegee Airmen’s successes encouraged President Harry Truman to integrate the armed forces in 1948.